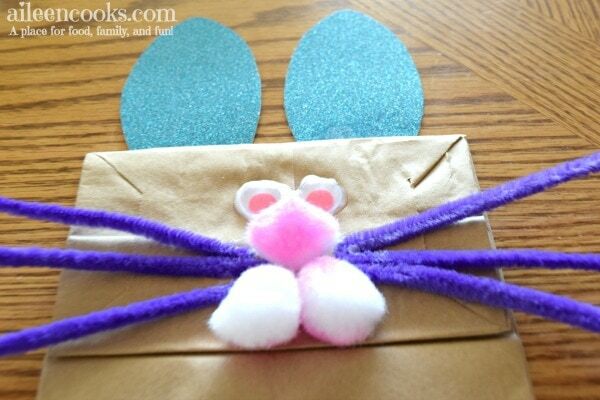 This post on Paper Bag Bunny Puppets contains affiliate links. Read my disclosure policy here. 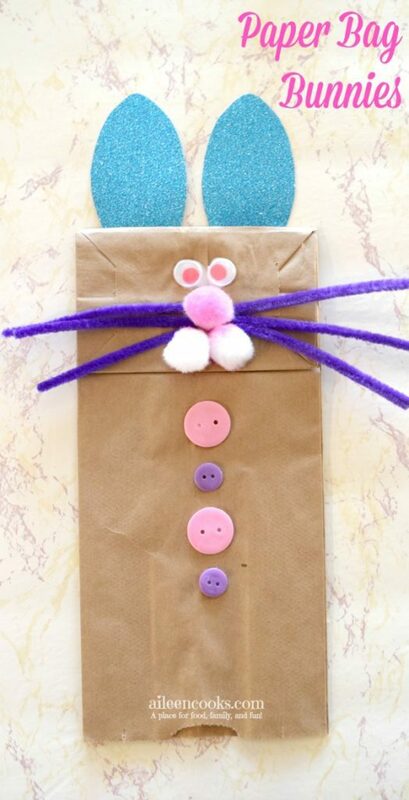 Celebrate Easter with this fun and easy to make paper bag bunny puppet. All of the materials used for this project were purchased at my local dollar tree. I spent less than $10 on this craft and have leftover supplies for future projects. I love making paper bag puppets because they are easy to make, fun for kids, and are a relatively short project. I made these paper bag puppets with my 5, 3, and 1-year-old kids. They all loved making them! Note: I have linked to Amazon for your convenience. You may be able to find all of these items at your local dollar store. If you don’t have access to a dollar store (or would rather shop online), than this kit with pipe cleaners, wiggly eyes, and pom poms is a great value. Start by cutting out two ear shapes from your glitter paper. Flip your paper bag over and glue the ears to the bottom of the paper bag. You will want it opposite side of where the bottom of the bag folds in and out. Wipe away any excess glue and flip over. Want more fun project ideas? Join our Facebook Group! Next, attach your google eyes. Snip your pipe cleaners in thirds and attach them on either side as whiskers. To make the bunny nose, glue one pom on top and two below, all squished together. You will need a lot of glue for the pom poms or they will fall off. 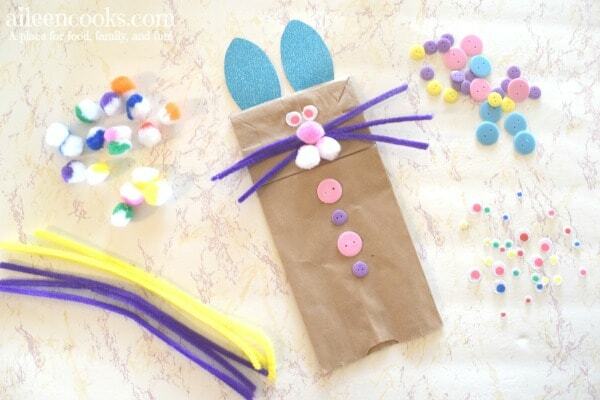 Finally, glue your buttons to the body of the paper bag bunny puppet. I really feel like the buttons finish off the puppet and make it extra festive for Easter. 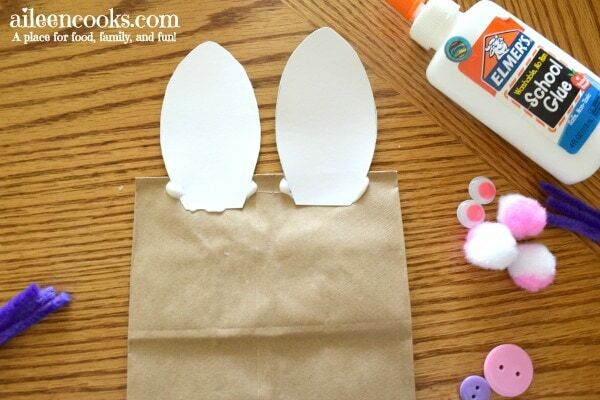 Let your paper bag bunny puppet dry overnight and read a book while you’re waiting! I love to pair crafts with a good book or two (like they do on the Virtual Book Club for Kids). Here are a few great books about Bunnies to go with this easy preschool craft. 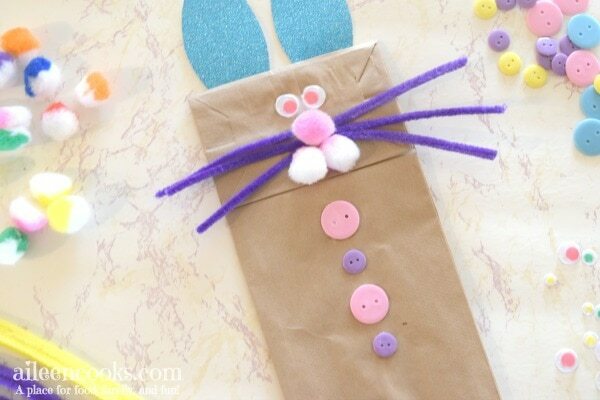 Did you try this paper bag bunny puppet craft? Let us know what you thought in the comments or tag us on social media using @aileencooks.